Objectives To evaluate if ‘wrap therapy’ using food wraps, which is widely used in Japanese clinical sites, is not inferior when compared to guideline adhesion treatments. Design Multicentre, prospective, randomised, open, blinded endpoint clinical trial. Setting 15 hospitals in Japan. Patients 66 older patients with new National Pressure Ulcer Advisory Panel stage II or III pressure ulcers. Interventions Of these 66 patients, 31 were divided into the conventional treatment guidelines group and 35 into the wrap therapy group. Main outcome measures The primary end point was the period until the pressure ulcers were cured. The secondary end point was a comparison of the speed of change in the Pressure Ulcer Scale for Healing score. Results 64 of the 66 patients were analysed. The estimated mean period until healing was 57.5 days (95% CI 45.2 to 69.8) in the control group as opposed to 59.8 days (95% CI 49.7 to 69.9) in the wrap therapy group. By the extent of pressure ulcer infiltration, the mean period until healing was 16.0 days (95% CI 8.1 to 23.9) in the control group as opposed to 18.8 days (95% CI 10.3 to 27.2) in the wrap therapy group with National Pressure Ulcer Advisory Panel stage II ulcers, and 71.8 days (95% CI 61.4 to 82.3) as opposed to 63.2 days (95% CI 53.0 to 73.4), respectively, with stage III ulcers. There is no statistical significance in difference in Pressure Ulcer Scale for Healing scores. Conclusions It might be possible to consider wrap therapy as an alternative choice in primary care settings as a simple and inexpensive dressing care. ‘Wrap therapy’ is a method for localised care of pressure ulcers using polyethylene sheets, such as in food wraps, to the pressure ulcers. There are numerous case reports promoting efficiency of this therapy in Japan. We hypothesised non-inferiority of the efficacy of wrap therapy on adult patients with pressure ulcers classified as National Pressure Ulcer Advisory Panel stage II or III comparing with that of guideline adhesion treatment to Japanese patients. The survival curves did not show the inferiority of wrap therapy comparing with guideline adhesion treatment on the period until the pressure ulcers healed. The result of this study implies clinical utility of wrap therapy, which has been reported many times in Japanese academic conferences concerned with wound healing and treatment of the older people. Bigger sample trials are necessary to confirm this implication as rigorous clinical evidence. 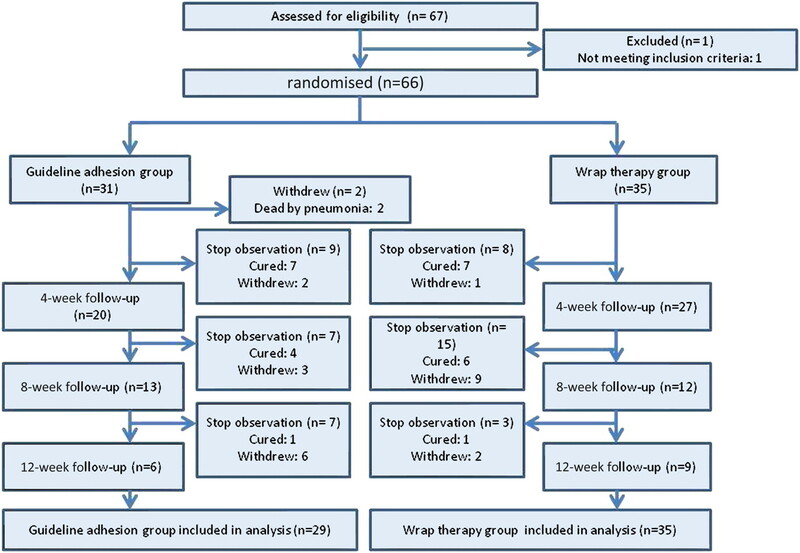 This is the first study revealing the efficacy of wrap therapy, that is inexpensive and simple for home care, using randomised controlled trail design. Relatively weak statistical power and impossibility of blindness of the treatment. ‘Wrap therapy’ is a method for localised care of pressure ulcers through which healing can be expected based on the natural healing effects by applying polyethylene sheets, such as in food wraps, to the pressure ulcers. This method has spread following its proposal by Toriyabe et al.15 On the effectiveness of wrap therapy in treating pressure ulcers, and of their simplicity and low cost, there are numerous case reports and case series research supporting no-inferiority of wrap therapy in Japan.16–20 On March 2010, JSPU approved wrap therapy as one of the first treatment choices in limited situations. Our purpose was to evaluate the efficacy of wrap therapy on adult patients with pressure ulcers classified as National Pressure Ulcer Advisory Panel (NPUAP) stage II or III on their backs using the current conventional treatment in Japan, described in the guideline published by JSPU, as a control. If this research verifies that wrap therapy is not harmful and has equivalent or better efficacy compared to conventional treatments, a low-cost treatment method can be well applied to the care of older people. The study evaluated outcomes and analysis of the prospective, randomised, open, blinded endpoint trial at numerous facilities. For this study, we recruited facilities by appealing to them for participation via mailing lists related to JSPU and those regarding pressure ulcer diagnosis and treatment. To assure implementation of the research work, we set the following as suitable standards for the facilities sharing the work: facilities that were able to use body pressure diffusion mats for patients with pressure ulcer, facilities with experience of wrap therapy on some patients, the existence of care systems for pressure ulcer care and environments that were able to perform pressure ulcer treatments during hospitalisation. Fifteen hospitals finally were identified to be eligible facilities. For patient registration, we set the following inclusion and exclusion criteria: patients aged 50 years or older with one or more NPUAP stage II or III pressure ulcers on either their torso or trochanter, body temperature of 35.5°C minimum to 37.5°C maximum, 600 kcal or over daily intake, no critical nutritional impairment, renal failure, cirrhosis, immunosuppression, uncontrollable diabetes or malignant tumours according to an examination performed within past 4 weeks. End-of-life patients whose estimated alive period was <3 months were excluded. When the patient did not possess the ability to make the autonomous decision to participate in the study, the outline and methods of the research were explained to their representing immediate family member, from whom written consent was obtained. After obtaining written consent, then uncoordinated random allocations were performed at the registration centre in the research office within 24 h.
Prospective, randomised, open, blinded endpoint design was applied for this study because blinding two different interventions was impossible in clinical setting. We adopted non-stratified pure random allocation for randomisation of the enrolled patients. If health staff obtained informed consent from eligible patients, then they send fax to the allocation centre located at Higashi-Washinomiya Hospital with basic information, including location and stage of pressure ulcers. The allocation centre finally decided eligibility and inform registration confirmation and allocation results to the facilities by fax within 48 h of the reception. To standardise the categories and treatment procedures of wrap therapy as much as possible, a meeting for instruction of interventions was held beforehand. A DVD of the lecture was distributed to the physicians who were unable to participate in the instruction meeting. Patients allocated to the control group were treated using methods conforming the ‘Evidence-Based Localized Pressure Ulcer Treatment Guidelines’ issued by JSPU.7 The diagnosis and treatment guidelines are created by JSPU based on current diagnosis and treatment evidence. To avoid the occurrence of observation bias, we established an ‘outcome evaluation centre’. Digital camera images were sent from every facility to the outcome evaluation centre, and all outcomes were evaluated there. The outcome evaluation centre was blinded so as not to know the treatment group to which the subject belonged. Because it was impossible to evaluate the exudates amount using images, records were made by the observer directly. In case the outcome evaluation centre found some problems that excuse the leakages of blindness, then that was reported to the administration office immediately. We also recorded the total amount of ointment used in localised treatments during the observation period and performed rough calculations with regard to cost. A safety evaluation committee was established comprising several specialists and non-specialists. The members were independent of the patient registration, research offices and the outcome evaluation centre. In all cases of death, worsening of the pressure ulcers during the research period, systemic deterioration or sepsis occurring within 30 days from the day of the protocol treatment and when the connection to the pressure ulcers was undeniable, researchers sharing the research at the core facilities reported to the committee. We aimed to clarify our statistical hypothesis that wrap therapy was not inferior compared to conventional treatments conforming to the guidelines. The mean period until healing for the localised treatment of stage II pressure ulcers was set as 21 days based on previous literature.9–14 The non-inferior threshold was set at 7 days according to clinical judgement. When set to a tolerable threshold difference of 7 days, when one side has a 5% significance level and a test power of 90%, the required number of cases in the two cohorts was 80. Similarly, the required number of cases for stage III pressure ulcers was 60. For the total number of target cases, the number of target registered patients was 140. The analysts were blinded about which group was the wrap therapy or the conventional treatment until the analysis was finished. Intention-to-treat analysis was performed. For the main endpoint comparisons, Kaplan–Meier plots were created, and the estimated mean value until the endpoint occurrence and its 95% CI were calculated. The differences in the PUSH scores were calculated from 2 weeks immediately after the start of observations, between 2–4 weeks, 4–6 weeks, 6–8 weeks, 8–10 weeks and 10–12 weeks and described the speed of pressure ulcer healing over time for both groups. We used PASW Statistics V.18 (SPSS, Inc) for the statistical analysis. We started recruitments in October 2009 and followed until May 2010. The study flow diagram is shown in figure 2. During the research period, a total of 66 patients participated. Of these, two could not be followed-up due to early discharge or transfer to another hospital. A total of 64 participants were analysed: 29 in the conventional treatment group and 35 in the wrap therapy group. The percentage of patients whose end points could be pursued 4 weeks after registration was 95%, 8 weeks after registration was 77% and 12 weeks after registration was 64%. The characteristics distribution of the patients analysed was 33 females and 29 males, and the locations of the target pressure ulcers were most common on the sacrum (56%), followed by the trochanter (13%), gluteus (6%) and the coccyx (5%). Table 1 shows a comparison of the patients' characteristics distribution, their health at registration, the status of their pressure ulcers and the treatment method for the two groups. The mean values in the conventional treatment and wrap therapy cohorts were 12.7 versus 12.7 for the Braden Scale at registration.23 The percentages using hydrocolloids, hydrogels or polyurethane foam as pressure ulcer dressings were 76% in the control group and 3% in the intervention cohort. The percentage of patients in whom healing of the pressure ulcers was verified from among the samples that could be followed-up at 4 weeks after registration were 26% of the conventional group as opposed to 21% in the wrap therapy group; at 8 weeks after registration, the percentages were 46% in the conventional group as opposed to 52% in the wrap therapy group. Figure 3A shows the survival curves of both groups. The mean of the estimated value until healing was 57.5 days (95% CI 45.2 to 69.8) for the conventional group as opposed to 59.8 days (95% CI 49.7 to 69.9) for the wrap therapy group. Figure 3B,C describes the survival curve for the patients with NPUAP stage II and III pressure ulcers, respectively. For stage II pressure ulcers, the estimated mean value until healing were 16.0 days (95% CI 8.1 to 23.9) for the conventional group compared to 18.8 days (95% CI 10.3 to 27.2) for the wrap therapy group. Meanwhile, for stage III pressure ulcers, the estimated mean value until healing were 71.8 days (95% CI 61.4 to 82.3) for the conventional group compared to 63.2 days (95% CI 53.0 to 73.4) for the wrap therapy group. (A) Comparison of survival curves using the period until pressure ulcers healing as the end point—all cases. Y axis means the proportion of patients who has not been confirmed healing of pressure ulcers. 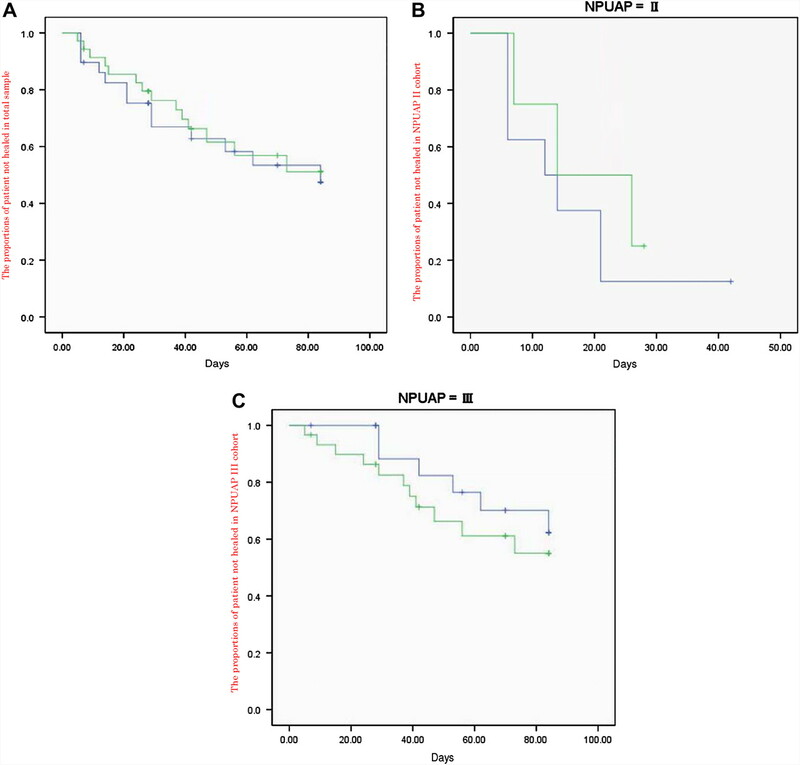 The distribution curves represent the results of an intention-to-treat survival analysis involving all patients in A, NPUAP stage II patients in B and NPUAP stage III patients in C. Blue line: conventional treatment cohort. Green line: wrap therapy cohort. Estimated mean period until healing (95% CI). Conventional treatment cohort: 57.5 days (45.2 to 69.8 days). Wrap therapy cohort: 59.0 days (49.7 to 69.9 days). p=0.75 log-rank (Mantel–Cox) test. (B) Comparison of survival curves using the period until pressure ulcers healing as the end point—NPUAP stage II pressure ulcers cohort. Blue line: conventional treatment cohort. Green line: wrap therapy cohort. Estimated mean period until healing (95% CI). Conventional treatment cohort: 16.0 days (8.1 to 23.9 days). Wrap therapy cohort: 18.8 days (10.3 to 27.2 days). p=0.42 log-rank (Mantel–Cox) test. (C) Comparison of survival curves using the period until pressure ulcers healing as the end point—NPUAP stage III pressure ulcers cohort. Blue line: conventional treatment cohort. Green line: wrap therapy cohort. Estimated mean period until healing (95% CI). Conventional treatment cohort: 71.8 days (61.4 to 82.3 days). Wrap therapy cohort: 63.2 days (53.0 to 73.4 days). p=0.42 log-rank (Mantel–Cox) test. The mean values of the difference in the PUSH scores at registration and upon either healing or the final observation divided by the treatment period were 1.1±2.1 points in the conventional group and 0.9±1.3 points in the wrap therapy group (p=0.73 Student t test). No significant difference was identified in the mean PUSH score reduction values in either cohort from immediately after the start of observations to the second week, from the second to the fourth week, from the fourth to the sixth week, from the sixth to the eighth week, from the eighth to the 10th week and from the 10th to the 12th week (table 2). During the total observation period, there was systemic worsening, such as pneumonia, occurring immediately after the start of observation in three cases in the conventional group and in four cases in the wrap therapy group. Two cases in the conventional group died of pneumonia and one died of heart failure for a total of three deaths. In the wrap therapy group, one patient died of pneumonia and one died of senescence for a total of two deaths. Regarding localised adverse events, there were problems with the covered skin (eczema, maceration, rash, etc) in the conventional group and six cases in the wrap therapy group. ‘Wrap therapy’ has already been introduced nationwide in Japanese clinical facilities. The main reasons for its spread in clinical settings are both that wrap therapy is a rational treatment method compared to basic wound-healing therapies, in that it is possible to maintain a lubricated environment without applying stress to the wound,24 25 and because compared to complex pressure ulcer treatments that combine various ointments and dressings, it has frequently been recognised empirically in actual clinical settings as having equal or better effects in treating pressure ulcers. Looking only at the main outcome survival curves, and taking all the patients into consideration, almost identical results were obtained in both the wrap therapy and conventional treatment groups for the period until the pressure ulcers healed. Meanwhile, when the two treatment groups are compared using the NPUAP classification, although no clear difference between the survival curves of the two treatments were identified with shallow stage II pressure ulcers, in the comparison between the stage III pressure ulcer cohorts, the survival curve of the wrap therapy cohort showed that healing tended to be faster than in the conventional treatment cohort. No statistical significance, however, was presented in this study. We cannot state so far that wrap therapy should be chosen as the first recommended therapy to shorten the healing time of pressure ulcer. Further study with bigger sample is needed to ensure these visual differences in survival curves. Nor was any significant difference identified between the wrap therapy and conventional treatment cohorts regarding the extent of PUSH score reduction either, and this result can also be stated to support the fact that wrap therapy is not inferior to conventional treatments. Nevertheless, initially, we estimated 80 cases and 60 cases in the NPUAP classification subgroups as the non-inferior estimate, but on this occasion, the total effective sample, at 64 cases, lacked sufficient statistical power. During the comparison of adverse events, there were concerns that skin problems caused by food wraps and perforated polyethylene used in the wrap therapy might occur, but in our research, no significant difference was identified with the results of the conventional treatments. Rashes due to adhesive plasters and tape were identified in four cases in the conventional cohort, but none were observed in the wrap therapy cohort. This is thought to be because it is basically possible to implement wrap therapy merely by making the patient wear paper diapers without affixing tape after applying the dressing. This research is the world's first randomised controlled trials that compares conventional treatments and wrap therapy. Theoretical superiority of wrap therapy to conventional treatments conforming to guidelines is the simplicity and cost-effectiveness of the treatment.20 26 Conventional treatments require the use of multiple ointments and dressings of suitable size and type, and the treatment requires a certain level of specialist skills. The simplicity of treatment protocols using wrap therapy might better promote the spread of care skills. Regarding cost-effectiveness, the various ointments and dressings such as hydrocolloid used in pressure ulcer treatments are often expensive, but the perforated polyethylene and diaper sheets used in wrap therapy can be supplied at <10 cents per treatment. If the accelerated pressure ulcer healing effects of wrap therapy are the same as those of conventional treatments, the efficiency of wrap therapy is presumably extremely great when considering cost-effectiveness. Larger scale additional tests strengthening the verified backing of these research results could offer new, simple and effective methods of pressure ulcer care and noticeably improve the benefits to both patients and society. This research, on the other hand, has some limitations. The greatest concern was impossibility of blindness of the treatment. Without blindness, health staff may have biases on the treatments themselves and wound evaluations. To minimise observation bias, we attempted to eliminate bias occurring during the evaluations by combining all the outcomes in a single outcome evaluation centre as far as possible. The second limitation resulted in bias among the participating facilities. Wrap therapy is currently viewed as an alternative treatment of choice. The facilities that participated in this research currently use wrap therapy clinically under this present condition, and the possibility of wrap therapy effects being overvalued beforehand cannot be denied. When we consider clinical application of wrap therapy, we should pay some attentions. First, because wrap therapy is simple and inexpensive method, it may be accepted for practical application in home care and primary care setting. Many primary care physicians and nurse practitioners are not familiar with complex protocols using new-coming modern dressings, which have additional advantages for quality of life for patients, and wrap therapy may be a useful application as an initial intervention for pressure ulcers. If wrap therapy is not effective, then using other modern dressings should be considered. Second, this attractive method has ethical concerns. Wrap therapy is not be approved as a formal medical intervention, which is covered social health insurance in Japan. Because this therapy uses food wrapping sheet without sterilisation, approval as an insured health intervention by Japanese Ministry of Health, Labour and Welfare is difficult. All devises for wrap therapy are so far prepared by health providers as voluntary actions. Even this therapy is useful for home-care setting, it should be examined under supervision of well-trained health professionals. Even though our conclusions failed empirical statement of effectiveness of wrap therapy directly, the results would not deny actual situations in current Japanese clinical settings. In future, as the rapid ageing of the population progresses worldwide, the problem of caring for the frail older people in Japan, which has the highest rate of population ageing in the world, will become a highly compelling problem in the societies of Europe and North America. Wrap therapy may be an epoch-making method of treatment, and the verification of its usefulness by clinical experiment is thought to be a major advance for the future elderly care. The authors thank the following volunteering facilities for registering patients for this study: Tokatsu-Clinic Hospital, Wakaba Ostomy Centre, Sozokai Heiwadai Hospital, Tokushima Kensei Hospital, Ryumondo Ono Hospital, Kojinkai Hoshigaura Hospital, Ibi Kosei Hospital, Niimi Central Hospital, Oyama Municipal Hospital, Hakuaikai Kaita Hospital, Yatsu Hoken Hospital, Kikai Tokushukai Hospital, Naruto Yamakami Hospital, Higashi Washinomiya Hospital and Kaneda Hospital. Shigeru Ichioka and Yuichiro Kume of the Orthopedic Surgery Department, Saitama Medical University for being in charge of the outcome evaluation centre and evaluating the images of pressure ulcers. Toshiko Yamana of the Human Care Studies Department at Tohto College of Health Sciences, Shingo Okada at Kitamihara Clinic and Yoshiaki Ito at Kiyosu Clinic for supervising the Safety Evaluation Committee, and Megumi Matsubara and Miki Hirano at Higashi Washinomiya Hospital.
. Protocol for the successful treatment of pressure ulcers. Am J Surg 2004;188(1A Suppl):9–17.
. Pressure ulcer management in the geriatric patient. Ann Pharmacother 1998;32:1221–7.
. Pressure ulcers in the nursing home. Ann Intern Med 1995;123:433–42. Agency for Health Care Policy and Research. Pressure ulcer treatment: Clinical Practice Guideline Quick Reference Guide. 1994;15:1–25.
. Systematic reviews of wound care management: (5) beds; (6) compression; (7) laser therapy, therapeutic ultrasound, electrotherapy and electromagnetic therapy. Health Technol Assess 2001;5:1–221.
. Support surfaces for pressure ulcer prevention. Cochrane Database Syst Rev 2008;(4):CD001735. Japanese Society of Pressure Ulcers. Evidence-Based Localized Pressure Ulcer Treatment Guidelines. Tokyo: Shorinsya Co., 2005.
. Decubitus direct current treatment (DDCT) of pressure ulcers: results of a randomized double-blinded placebo controlled study. Arch Gerontol Geriatr 2005;41:261–9.
. A randomized clinical trial comparing hydrocolloid, phenytoin and simple dressings for the treatment of pressure ulcers [ISRCTN33429693]. BMC Dermatol 2004;4:18.
. Topical treatment of pressure ulcers with nerve growth factor: a randomized clinical trial. Ann Intern Med 2003;139:635–41.
. Healing pressure ulcers with collagen or hydrocolloid: a randomized, controlled trial. J Am Geriatr Soc 2003;51:147–54.
. Sequential treatment with calcium alginate dressings and hydrocolloid dressings accelerates pressure ulcer healing in older subjects: a multicenter randomized trial of sequential versus nonsequential treatment with hydrocolloid dressings alone. J Am Geriatr Soc 2002;50:269–74.
. A randomized clinical study comparing a hydrocellular dressing to a hydrocolloid dressing in the management of pressure ulcers. Ostomy Wound Manage 1999;45:39–44, 6–7.
. A systematic review of the use of hydrocolloids in the treatment of pressure ulcers. J Clin Nurs 2008;17:1164–73.
. Use of a food wrap as a dressing material. Adv Wound Care 1999;12:405–6.
. Treatment results and problem of Wrap therapy. Japanese Journal of Pressure Ulcers 2009;11:286–7.
. Clinical effectiveness and efficiency of wrap therapy for pressure ulcers. Japanese Journal of Pressure Ulcers 2002;4:427–30.
. A study of food-wrap therapy for Stage III and Stage IV pressure ulcers. Nippon Ishikai Zasshi 2000;123:1605–11.
. Wrap for leg ulcers. Am J Nurs 1996;96:17.
. Use of food wrap films for treating pressure ulcers. Japan J Med Pharm Sci 2006;55:561–7.
. An evaluation of polyvinylidene film dressing for treatment of pressure ulcers in older people. J Wound Care 2006;15:449–50, 52–4.
. Pressure ulcer assessment instruments: a critical appraisal. Ostomy Wound Manage 1999;45:42–5, 48–50, 53–55.
. Patient risk factors for pressure ulcers during cardiac surgery. AORN J 1997;65:933–42.
. Wound healing: a new approach to the topical wound care. Cutan Ocul Toxicol 2011;30:92–9.
. Importance of moisture balance at the wound-dressing interface. J Wound Care 2003;12:125–8.
. Economic evaluation of pressure ulcer care: a cost minimization analysis of preventive strategies. Nurs Econ 2009;27:390–400, 415. Funding This study was supported by Division of the Health for the Elderly at Japanese Ministry of Health, Labour and Welfare. Grant name ‘Examination and Research Work into New Pressure Ulcer Treatments for the Care of the Elderly’. Funding agency did not interfere with any process of study content. All researchers are independent of the founder. No funding was received from any specific commercial company. Ethical approval The Japanese Academy of Family Medicine Ethics Review Board examined and approved our research plan and informed consent process in October 2009. Contributors SB conducted literature review, developed the initial protocol, examined statistical analysis and drafted the manuscript. AM wrote grant application, recruited collaboration facilities, developed the intervention protocol and planned research meeting and start-up meeting. SO contributed to research design, reviewed and amended the research protocol including intervention protocol and contributed to enrolment of patients. KT also contributed to research design, reviewed and amended the research protocol and contributed to enrolment of patients. MS contributed to basic concept of research design, reviewed and amended the research protocol. KA contributed to enrolment of patients and acquisition of data. KK contributed to research design and enrolment of patients. KM managed an outcome evaluation centre. All authors meet International Committee of Medical Journal Editors authorship criteria for inclusion.